[For New Year Party, Welcome Party, Farewell Party, Surprise] We will introduce five major benefits that you can choose to celebrate the protagonist in full scale! New Year's Day / Birthday Party / Farewell Party / Welcome Party / Thank-you Party / Special Event / Seminar Celebration / Graduation Celebration / Job Celebration / Affiliation / Alumni Association / 10 Major Rewarding Service Coupons that can be used to celebrate the leading role on special occasions All the staff will surprise you, so it will be a memorable day, no doubt! Leave the celebration to Aiyo !! 5 major benefits all free! Benefits like secretary is the most rewarding! One person free for 10 people or more! 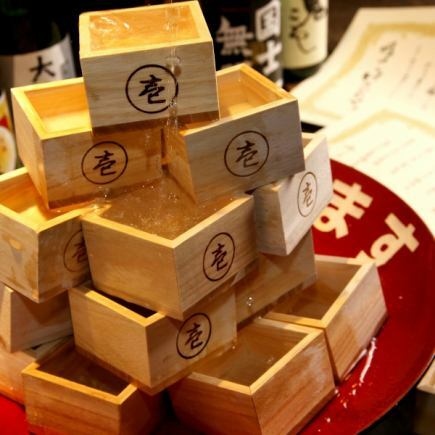 We can pour sake into a large bowl of 40 cm or more in diameter and celebrate! It is a standard of celebration things! ♪ BGM can also choose that favorite song of the leading role !! Please bring any memories etc. !! Meal ticket present that can be used next time! For each celebration, the staff's full of excitement! I promise! The secretary who wants the protagonist and the guest to enjoy! Please consult with our professional and love staff!